Jinder Mahal is undergoing extensive training with ace Indian boxing champion Vijender Singh ahead of WWE live India. 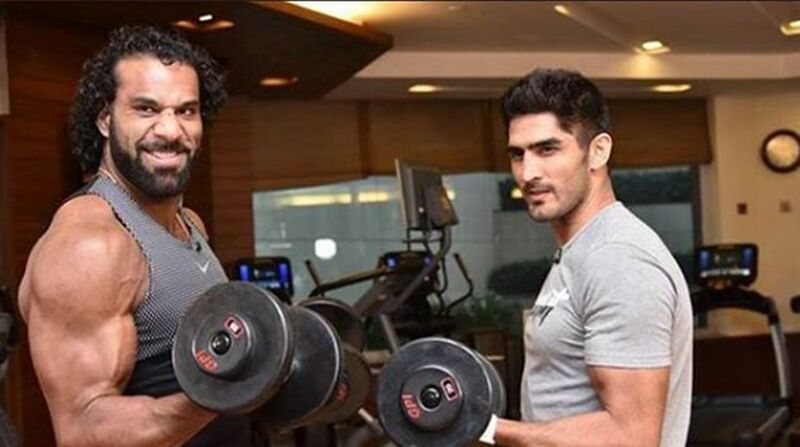 Former WWE champion Jinder Mahal is undergoing extensive training with WBO Asia Pacific Super Middleweight champion Vijender Singh ahead of former’s WWE live event in India on December 9. Two dangerous professional sports collaborate for one common cause — India’s honour. Jinder, who is currently in India ahead of his debut match in his home country, will be facing legend Triple H in the main event of the night. WBO Oriental Superweight champ Vijender Singh is making sure that the former WWE champ doesn’t lack behind in his training when he faces the cerebral assassin, Triple H.
The first ever Indian WWE champion, Jinder, shared an image on his Instagram, where he can be seen training hard with the boxing champion. Interestingly, Vijender also presented Jinder with the first ticket of his upcoming fight “Rajasthan Rumble” and wished him luck for his match ahead of the super show presented by WWE. While Jinder will defend his country’s honour against Triple H, Vijender will defend both his titles in “Rajasthan Rumble” against Ghana’s Ernest Amzu in Jaipur on December 23.